Offers: Mill Green welcomes visitors and offer discounts and packages to groups of 12 or more golfers and for TSG Members. Changing rooms; Club, buggy & trolley hire; Fully stocked professional shop; Practice facilities include driving range, chipping area, putting green; 9 hole par 3 course (Romany); Bar and full catering facilities. Part of the Crown Golf group (32 courses) and located in the beautiful Hertfordshire countryside, Mill Green is the perfect place to spoil a walk! Set in over 200 acres of Hertfordshire countryside, Mill Green Golf Club combines an excellent golf course with hospitality and charm. The gently undulating landscape with its mixture of rolling meadows and ancient woodland has enabled Peter Alliss and Clive Clark to create a challenging golf course of outstanding beauty. The contemporary clubhouse allows the golfer to relax in comfortable surroundings that have more than a touch of elegance. In addition to the wonderfully crafted Alliss/Clark course, we have an excellent range of facilities to help you to relax and enjoy your time at Mill Green Golf Club. Throughout the 6,615 yards of this par 72 course, water features, large bunkers, trees and expansive greens combine to offer a challenging, as well as a most enjoyable golfing experience. 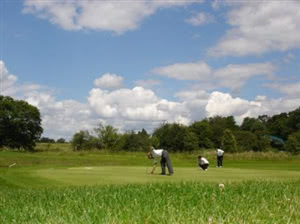 The front nine, which plays towards the small village of Mill Green itself, is both open and undulating, and by comparison the back nine plays directly towards Hertford and is noted for its narrow fairways which work their way through ancient woodland and large lakes. Interesting Course In Places !! I visited Mill Green GC yesterday, on a lovely sunny afternoon, for the first time and found it to be quite interesting in places, although quite a few of the front nine holes were either doglegs or blind holes and fairly open. Once you cross the road, the back nine became a lot more interesting and challenging with water and tree lined fairways. The uphill par 3 15th was a very nice hole surrounded by trees, it gave that nice echo when the ball came off the club. The course was fairly flat, which made a nice change, not having to struggle up hills in the wintry weather. Clubhouse was fresh and clean and the service came with a smile throughout. Well worth a visit, especially with discounted rates for TSG Members as it's a Crown course !! Don't want to be critical of this course as it is a nice course. Holes 15, 16 & 17 are fantastic but the rest of the course is just ok. Clubhouse is very very nice and the staff/pro are very friendly. Wouldn't pay the full green fee to play here, very expensive for what it is. Wouldn't put anyone off going there just not sure I'll be rushing back. A great course not to long but well planned and bunkered.